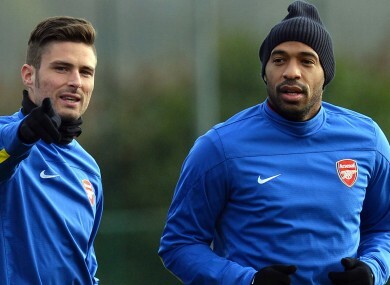 Olivier Giroud with Thierry Henry (file pic). OLIVIER GIROUD HIT back at Thierry Henry and labelled him “dull” over claims that he was not good enough to fire the club to the Premier League title. In his role as a Sky Sports pundit, Henry – Arsenal’s record goalscorer and part of the “Invincibles” side that won the 2004 Premier League – claimed that Arsene Wenger needed to invest heavily to improve the spine of his squad following last month’s 0-0 draw against Chelsea. Giroud, who signed from Montpellier in 2012, has taken exception to Henry’s criticism and admits he was disappointed by his fellow Frenchman’s assessment. “I heard he was saying too many dull things. That was a bomb and it had its desired effect,” Giroud told L’Equipe. “It was surprising to hear him take apart the team. I say ‘team’ because it wasn’t just me, it was the spine. I think he’s wrong. “I didn’t enjoy hearing it. Coming from an ex-France and Arsenal striker, it’s a shame. It was a bit easy for him to say that after Chelsea game. Email “Olivier Giroud hits back at 'dull' Thierry Henry”. Feedback on “Olivier Giroud hits back at 'dull' Thierry Henry”.